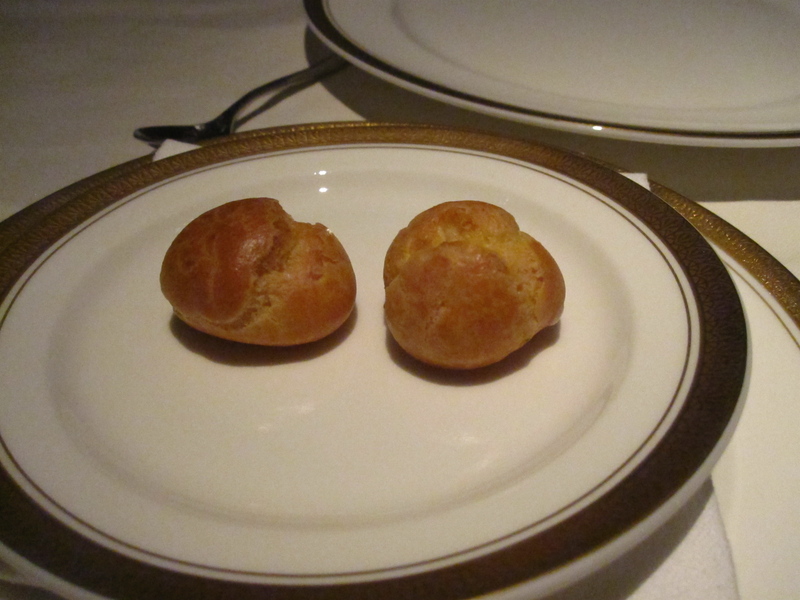 We started with the gougères, the original “cheese puff” said our waiter, and they were just that, warm and crunchy on the outside, gooey on the inside. 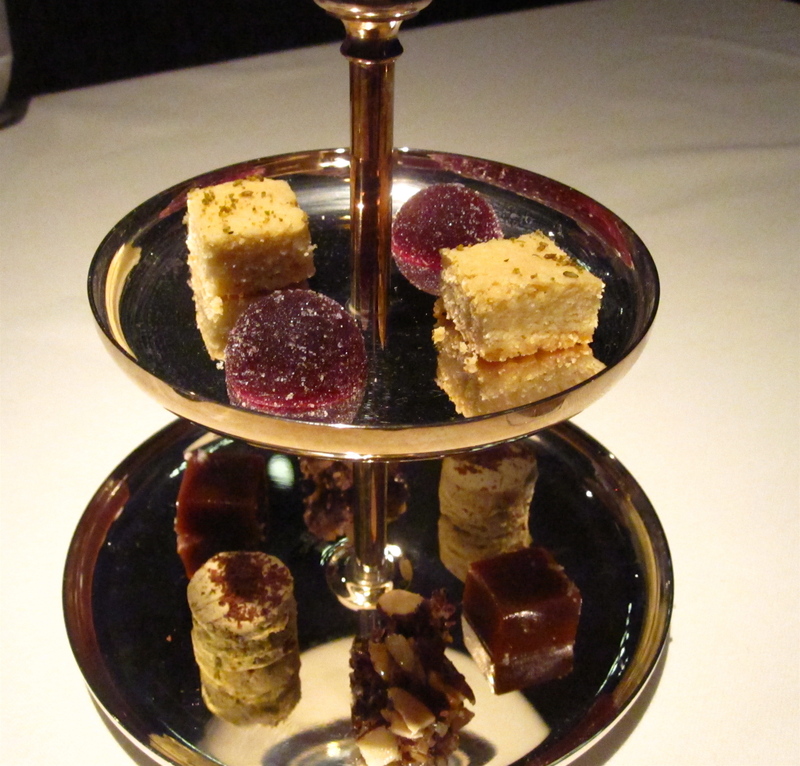 Next came the stunning hor’s d’oeuvres tray. 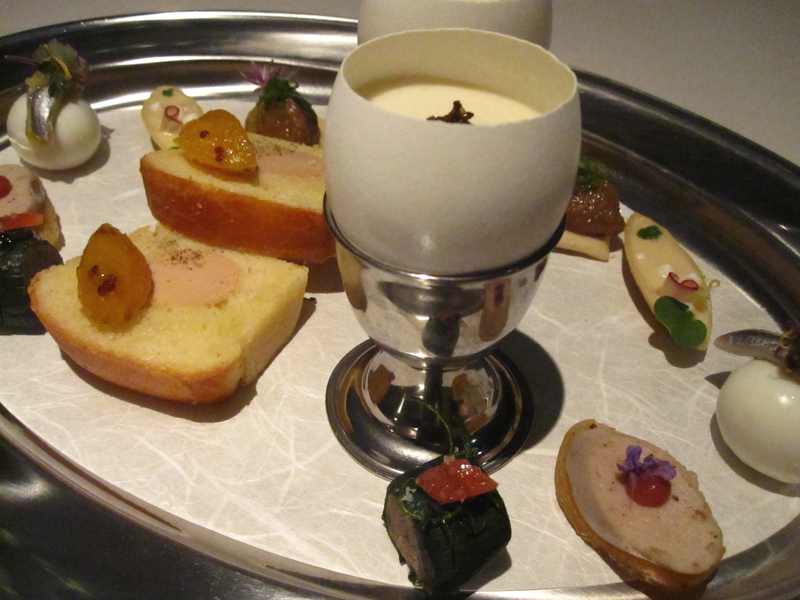 Presented as a homage to buffet and tray-style dining of the time, it was filled with tiny bites of quail eggs with anchovy, brioche with foie gras and apricot jam, crackers topped with pork rillettes, and that egg I mentioned before. 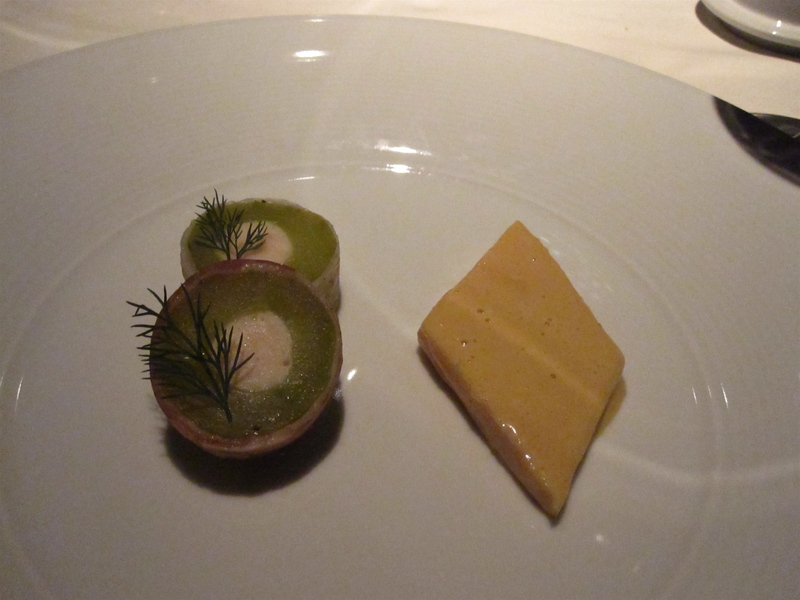 A hallowed out egg was filled with a warm, rich and wonderful egg custard topped with truffle. We wanted to lick the shell..and have seconds. And the combination of sweet apricot jam smothered over foie gras stuffed brioche pretty much put us over the edge. 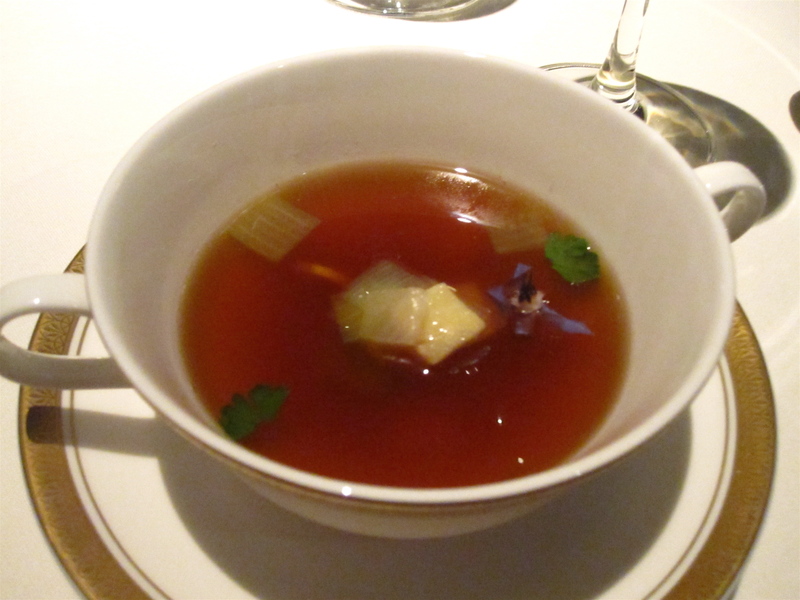 Next came a lovely turtle soup, a dish I hadn’t had before that was a like a light but meaty and flavorful consommé. 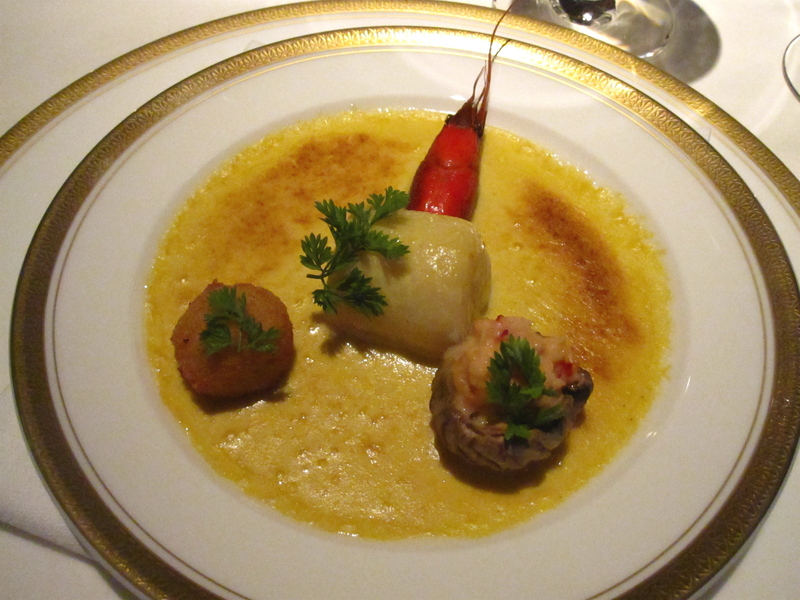 The following course celebrated the sea, and crayfish, with a crayfish-stuffed mushroom, delicate perfect piece of sole, sole roe and a sole-stuffed crayfish all resting in a rich, briney sauce normande we quickly sopped up with housemade bread served on the side. The suprêmes de poussin was next, a beautiful, juicy triangle of blue foot chicken with an almost poached cucumber maki stuffed with chicken mousse. I truly love a good piece of chicken, and this course took poultry to a whole new juicy level, so much so it almost overpowered the cucumber bites. After a lovely piece of chicken, we were ready for the a stunning piece of duck, or leg and sliced, fanned-out breast for which the duck sauce was churned from the whole duck (bones and all) out of an antique duck press. 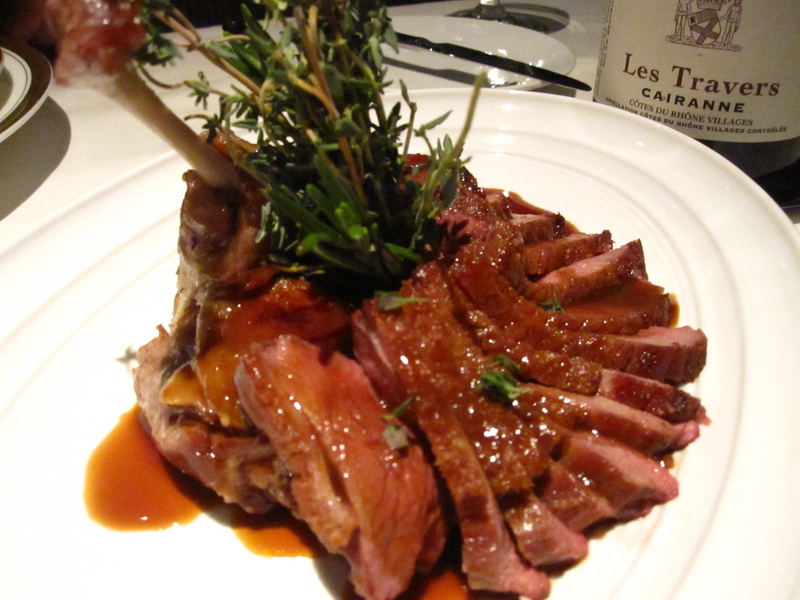 Each juicy, intense slice melted in our mouths, and the fall-of-the-bone leg meat was divine, and a fragrant bunch of thyme sprigs tied everything together. Along with the duck came the most luscious combination of cheese and a pile of thinly sliced potatoes I’ve ever experienced. 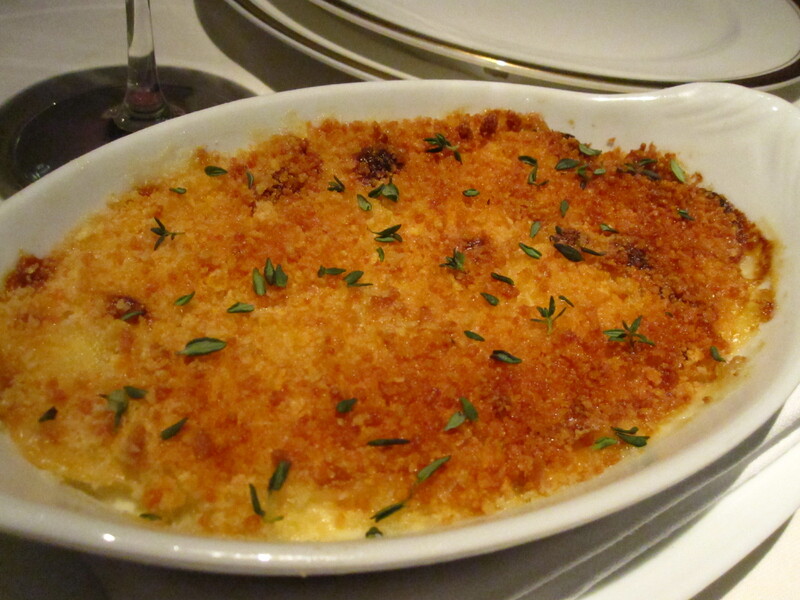 Gruyère cheese was the star of the ultra-rich dish topped with a layer of perfect golden crunch conducive to a cold Chicago spring. Chicken, foie gras, duck, potatoes and cheese..no one said classic French cuisine was light. 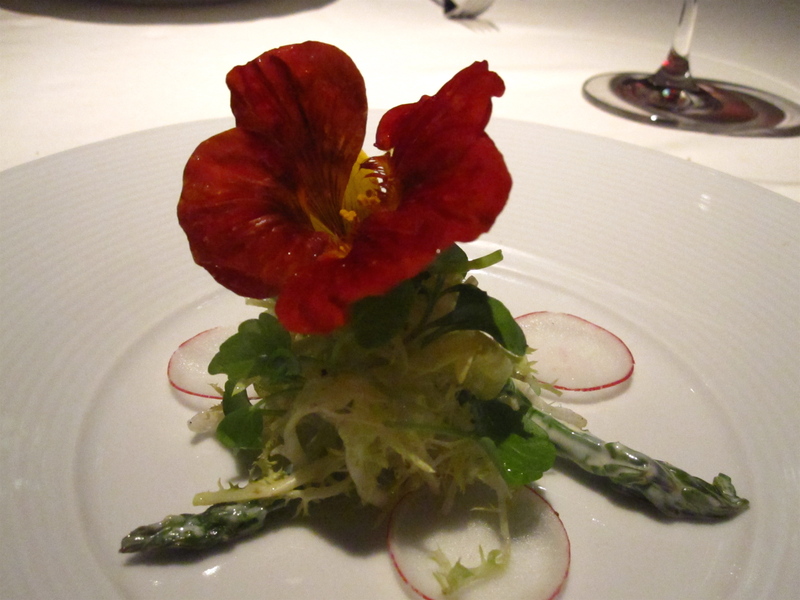 A palate-cleansing Salade Irma came next with asparagus, greens and a nasturtium blossom. 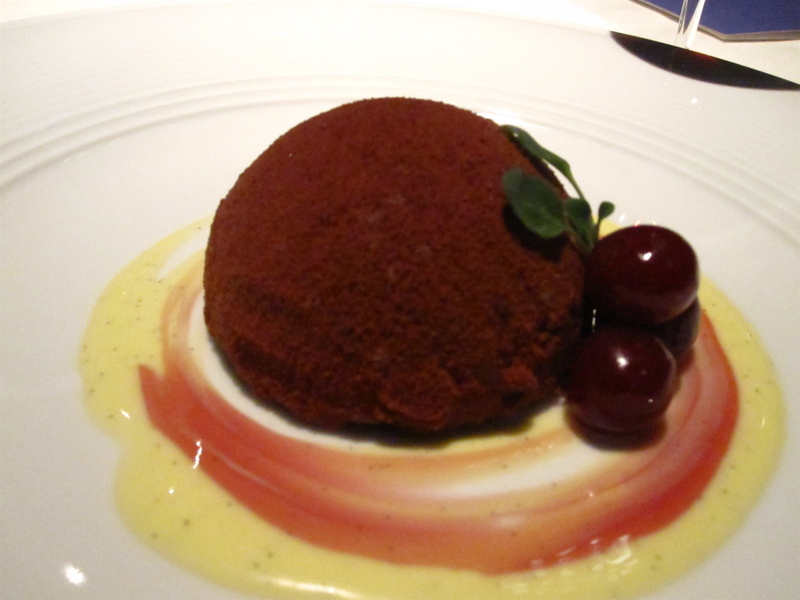 It was the perfect segueway into dessert, a light, refreshing bombe ceylan with a cocoa shell, and frosty hint of mint and coffee, cookie bottom and rum-soaked cherries. It was fresh, light, slightly unexpected, and had all the right textures. Wow, lucky gal. What a great experience, thanks for sharing it. Wow! The meal sounds delicious! How did you find out about it? Hello XMI, I started hearing about Next last year, and couldn’t wait to get in. When I had a chance to get tickets, I jumped on them! It was an awesome experience. 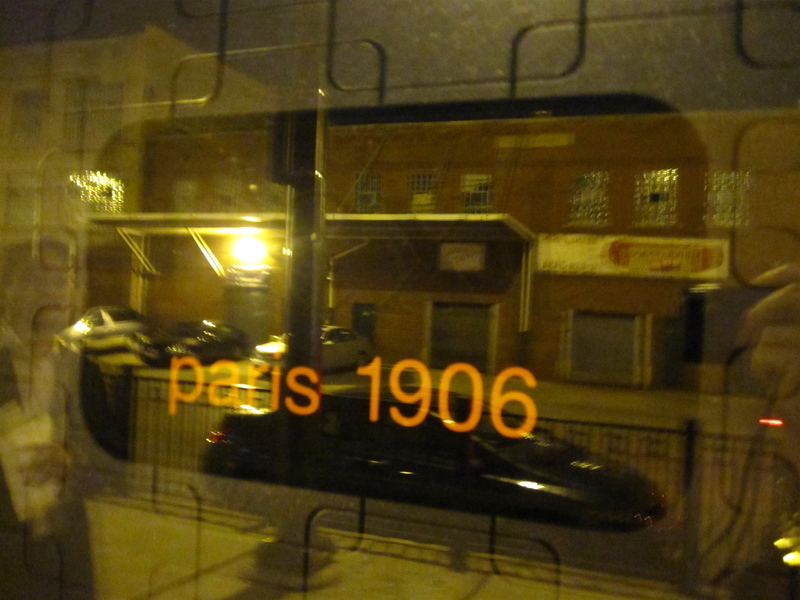 If you are ever in Chicago, I recommend a visit!